Celebrity chef and restaurateur Michael Voltaggio stars in PSA to shine a light on the issue and inspire diners to "book responsibly"
SAN FRANCISCO, March 21, 2017 /PRNewswire/ -- OpenTable, the world's leading provider of online restaurant reservations and part of The Priceline Group (NASDAQ: PCLN), today unveiled a "book responsibly" campaign spotlighting the impact of no-shows and late cancellations on the restaurant industry. 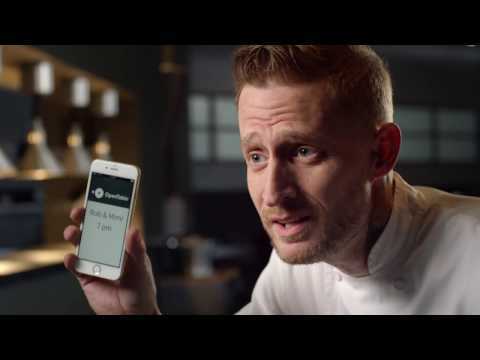 OpenTable partnered with celebrity chef and restaurateur Michael Voltaggio to release a public service announcement to advocate for diners to book responsibly by canceling or modifying their reservation when their plans change. OpenTable partners with celebrity chef and restaurateur Michael Voltaggio to release a PSA spotlighting the impact of no-shows on the restaurant industry and advocating for diners to "book responsibly"
"Many people simply don't realize the impact that no-shows and late cancellations have on the restaurant industry," said Scott Jampol, Senior Vice President of Marketing at OpenTable. "At OpenTable, we believe we have a responsibility to help build awareness of the issue and continue to leverage our technology and diner network in ways that reduce no-show rates and mitigate the impact of late cancellations." "It might seem harmless to bail on a reservation but if you can't make it, letting us know ahead of time makes a world of difference," said Michael Voltaggio. "If we're constantly working to address no-shows on a daily basis, our business suffers. That's why we are asking diners to book responsibly." Voltaggio isn't alone. Kim Alter from San Francisco-based Nightbird notes that she wishes "diners knew how hard it is to run a restaurant" and that canceling at the last minute or no-showing "makes it even harder." And Michael Davis from Sprout LA counsels diners to "not be afraid to cancel your reservation – we appreciate a cancellation more than a no-show." OpenTable's no-show rate in the U.S. is approximately 20 percent lower than the no-show rate for diners who book via phone. OpenTable believes that this lower rate is helped by making it easy to modify or cancel a reservation with a couple taps of their phone and by its email and mobile notification reservation reminders. To help refill tables freed up due to late cancellations on restaurants, OpenTable immediately surfaces the newly available tables to its millions strong diner network. To watch the PSA video and learn more about the importance of booking responsibly and the impact of no-shows and late cancellations on the restaurant industry, visit http://bookresponsibly.opentable.com/. OpenTable, part of The Priceline Group (NASDAQ: PCLN), is the world's leading provider of online restaurant reservations, seating more than 21 million diners per month via online bookings across more than 40,000 restaurants. The OpenTable network connects restaurants and diners, helping diners discover and book the perfect table and helping restaurants deliver personalized hospitality to keep guests coming back. The OpenTable service enables diners to see which restaurants have available tables, select a restaurant based on verified diner reviews, menus, and other helpful information, and easily book a reservation. In addition to the company's website and mobile apps, OpenTable powers online reservations for nearly 600 partners, including many of the Internet's most popular global and local brands. For restaurants, the OpenTable hospitality solutions enable them to manage their reservation book, streamline their operations, and enhance their service levels. Since its inception in 1998, OpenTable has seated over 1 billion diners around the world. OpenTable is headquartered in San Francisco and has bookable restaurants in more than 20 countries, including Australia, Canada, Germany, Ireland, Japan, Mexico, United Kingdom and the United States.